In Shirley’s debut picture book, a young boy performs gymnastics moves everywhere he goes. Timmy, a light-skinned boy with brown hair, tumbles “all the way to school / up the hill... / down the hill.” At school, he walks on his hands while lining up with his diverse classmates, and enjoys playing on the exercise equipment in physical education class. After lunch, during which Timmy eats pasta spirals that are reminiscent of his twirling moves, he resumes tumbling on the playground until he starts to feel dizzy. After school, he excitedly attends his gymnastics class, where he happily performs warm-up stretches, forward rolls, cartwheels, and a headstand. However, he becomes frustrated when he struggles to master a new, complicated move called a backflip. Although it’s fun practicing at first, Timmy “ran too fast and jumped too high and landed on his bum! !” As a result, he no longer wants to keep trying. However, the Coach, not shown in the illustrations, encourages him with a motivational rhyming passage. Reinvigorated, Timmy then “tried to be the best that he could be and practiced backflips 100 times.” Most pages in this book feature minimal, rhythmic text that clearly reflects the events in the bold, colorful illustrations, and young readers will enjoy sounding out the simple, action-oriented words. 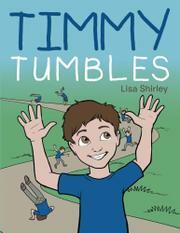 Timmy’s passion for gymnastics is relatable and the story’s overall message regarding hard work and determination is laudable. However, the light, breezy tone at the beginning of the book changes towards the end, as pages become much more text-heavy and lack accompanying images. Specifically, one page explaining Timmy’s detailed gymnastics-class routine reads more like a list, as none of the moves are shown in the accompanying illustration. The book would be more appealing if the appropriately sparse text in the beginning remained consistent throughout. A kids’ story with an engaging premise that stumbles in its execution.